I had decided to spend my 20 days vacation this time in India and soak in the culture. I wanted to visit Delhi, Goa and Kerala for yoga recreation in my trip . This article is not going to be about my trip, but rather about how to get India E-Tourist visa for Malaysia citizens and how you can get your visa cheaper than official government fees. Malaysian citizens are in 13th place in terms of visitors to India. With the implementation of E-Visas, the number of tourists to India has increased steadily. The numbers are expected to increase in the coming years also. This article will be of help to the citizens of Malaysia in applying for India E-Tourist visa and how you can get your it cheaper than government fees. How to get India E-Tourist visa for Malaysian citizens below government fees ? You will receive an email from indiavisainfo.com about your visa fees in 1 hour. Your visa fees can be anywhere between MYR 0 to MYR 450. You need to just accept the quote no payment needed yet. Do Malaysian citizens need a visa for travel to India? Yes, all foreign nationals visiting India must possess a valid visa before arriving in India to avoid being denied entry into the country. Is it possible to get Visa on arrival in India for the citizens of Malaysia? India no longer provides visa on arrival for foreign nationals. One has to apply for an India visa before arriving in India. Application for E-Visas can only be done online and it will take a minimum of 2 days for approval. Therefore, one cannot apply for a visa at the airport. E-Visas: E-Visas are Electronic visas that are issued to foreign nationals who apply for an India visa for short duration medical, business or tourism purposes. E-visas can only be applied online. Regular visas: They are also called sticker visas because once approved these visas will be stuck in your passport. Regular visas are of longer validity than E-Visas.Regular visas may be valid for a period of up to 10 years with multiple entry benefits. They visas have to be applied for at the concerned Indian embassy after taking a prior appointment. Citizens of Malaysia who want to visit India for tourism for a period of fewer than 60 days can apply for an E-Tourist visa. What are the documents needed to apply for India E-tourist visa for citizens of Malaysia? It is very important that one uploads the photographs and scanned copies of the documents in the above-mentioned specification and size. Even a slight deviation from the specification will result in rejection of your application. To avoid these risks you can avail the service of an India visa agent for a very low fee. These agents have years of experience in the visa processing industry hence, they can handle the job for you. The India visa agent we work with accepts photographs and scanned copies of any format or size. They will later edit them to the required specification. They even accept photographs that you take on your iPhone. On the other hand, If you want to apply b yourself make sure that you have all the required documents and photographs ready before you start applying. Over the past years, the number of scamming websites has increased drastically. The pathetic condition of the official website has lead to these issues. Users who try applying for an E-Visa through the official website ends up being frustrated and they become vulnerable to these scams. These scamming websites offer services like express visas for $300 which do not exists. Be very careful while dealing with agents who claim to get your E-Tourist visa approved in a day. You should talk to your agent and clear all your doubts and talk to them about the services they offer. Never pay the full amount in advance. How much does it cost the citizens of Malaysia for India E-Tourist Visa? It will cost citizens of Malaysia $50 for an Indian E-Tourist visa. If you want to process your visa through a Visa agent they will charge an additional $50 as their service charge. Through a reliable India visa processing agent. The easiest and hassle-free way would be to apply through a reliable India visa processing agent, these agents are well experienced hence, they can get the job done for you very easily. They charge only a very nominal fee as their service charge. Applying through the official website is a hideous task because there are a lot of reliability issues with the website and you can expect absolutely no support from their side.Keeping this in mind we would recommend you to process your E-Tourist visa through a reliable India visa processing agent who can handle the entire process with minimum hassle for you. The only India visa processing agent we would recommend is indiavisainfo.com. Unlike the other agents, they charge only a very nominal service charge and offer their customers the best in the class service. They charge a very low service charge of $50 for handling the entire visa application process and $25 for handling only the payment.One has to make an advance payment of 50% of the service charge in order for them to start processing your application. 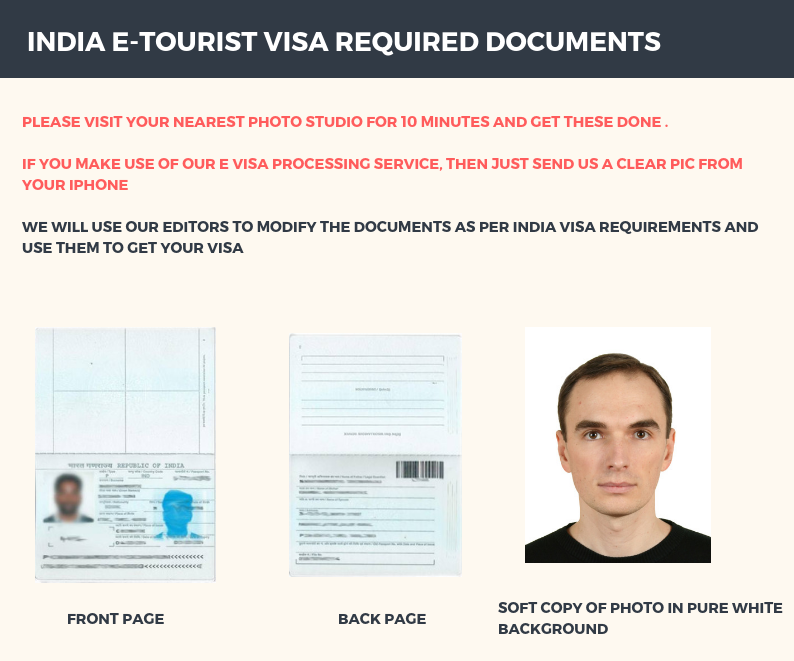 The rest of the payment has to be made only after the agents contact you with a valid visa (which can be verified at the official website of the Indian government). Along with submitting the form, one needs to make an advance payment of 50% of the service charge for them to start processing your application. Once they receive the payment and form they will allocate an agent for your visa processing.You will be contacted by the agent after they get your visa approved. You can verify the Visa ID they give you from the official website of the Indian government. The portal where one has to do the first part of the application is unstable and unreliable because of the poor design parameters. The website is unable to handle a sudden surge in traffic making it crash almost every time. You can even expect it to crash when you are at the very end of the application process. The only feasible solution to this issue is to hire an expert visa agent who can handle the process for you consequently, saving you from the hassles.These agents will make sure that you get your E-Visas without any hiccups. The experienced agents will keep on trying until they get it right. The payment portal is so unreliable that it takes a miracle to get the payment successful on the first go. The banks are not capable of accepting online payments from international customers because of the lack of good server maintenance. Things won’t be easy, you will only get 3 attempts to make a successful payment. That is,If you fail to make a successful payment in 3 attempts they will block your application ID and you will have to start filling in the part 1 application from scratches. No, It is not possible to extend the validity of your E-visa that is none of the E-Visas are extendable or convertible. For visas with longer validity, one can apply for sticker visas. I really did got frustrated at the time of making payment to the govt website. You guys have have done it easy for making payment and the process went smooth. Thank you so much for the help. I received the Visa right now. Thank you for a quick response you're just awesome. Worth recommendable website for Indian Visa.